>> Whoa, ok so it's been over six weeks since I've posted some musings. Lack to inspiration I guess you could say. It's just been a little nuts around these parts. But, as you can tell, inspiration has returned and I now have a new look! I've been learning so much awesome Photoshop stuff, I just can't stop. Hope you like it! >> As for the above photo, that is in fact my adorably handsome husband back in his "glory days" of college. 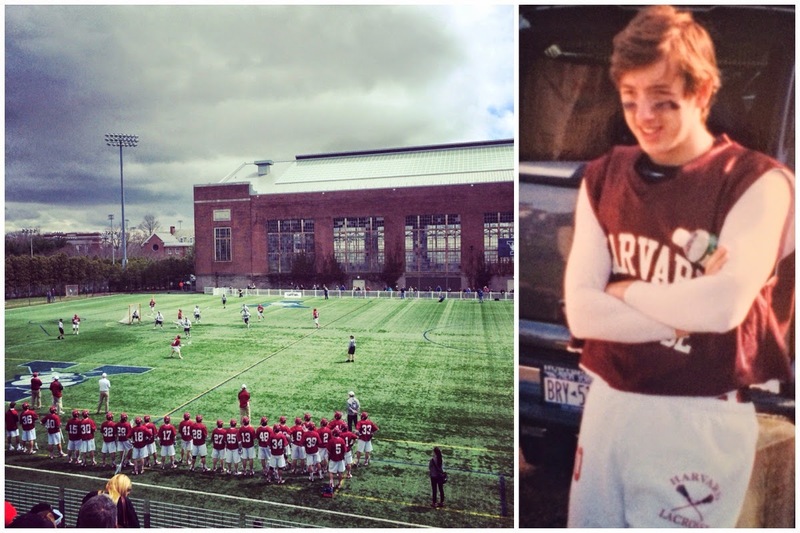 I got taste of those days when we went to the Harvard vs. Yale lacrosse game on Saturday. It was really fun to cheer for C's alma mater and laugh at the hilarious comments from the parents. The rain stopped for about three hours and the sun came out which was glorious. >> I'm legitimately obsessed with Jessica's "Favorites" posts. She always turns me on to so many amazing products and I always have to have an Ulta and Sephora tab open on my browser so that I can pin all the good stuff. You'll love it to, promise. ALSO VERY IMPORTANT: Go pre-order her new cookbook that just came out today. You'll die it's going to be so amazing. But seriously, I'm obsessed. >> We can talk about Easter for a sec if you want...we had a lovely weekend in Baltimore catching up with C's buddies and getting spoiled by his parents. It's always wonderful to get away for the weekend and soak up some sun. The entire weekend revolved around food (delish!) and candy. My kind of weekend. >> Two weekends ago, we drove up to Mystic for a little getaway and ate at the most amazing "beer, bourbon & burgers" restaurant called The Engine Room. It's a must-try if you're ever in the area. We lingered for quite some time, tasting whiskey and munching on monkey bread with salted bourbon caramel sauce. >> I'm dying to try this new Tarte mineral foundation. I've been a die hard tinted moisturizer girl for quite some time now but sometimes it's just too much in the summer. I'm really intrigued by all the glowing reviews I've read online. I also just got a 20% off coupon for signing up for their email list...soooo probs gonna have to go ahead and add to cart.